The Rev. 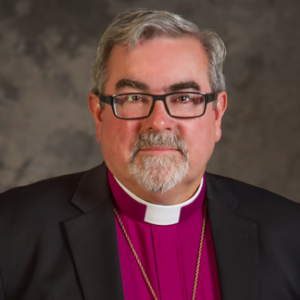 Dr. R. Guy Erwin was elected as fourth bishop of the Southwest California Synod of the Evangelical Lutheran Church in America in May, 2013, and was consecrated as synod bishop on the Feast of St. Matthew, September 21, later that year. At the time of his election, Dr. Erwin held the Gerhard and Olga Belgum Chair in Lutheran Confessional Theology at California Lutheran University in Thousand Oaks, and was under call to the Synod as a professor and part-time interim pastor. Dr. Erwin and his husband, Robert Flynn, moved to Southern California in 2000 from New Haven, Connecticut, where Dr. Erwin had taught church history and historical theology at the Yale Divinity School, and Mr. Flynn (a native of West Virginia and a graduate of YDS) worked in scholarly publishing at the Yale University Press. They live now in the Woodland Hills neighborhood of the San Fernando Valley in Los Angeles with their pet Jardine’s Parrot, Echo. Bishop Erwin holds a bachelor’s degree from Harvard University and a doctorate from Yale University. He also received a Fulbright grant for two years of study at the University of Tübingen in Germany, and an IREX grant for a year at the University of Leipzig. His doctoral dissertation was on the late medieval roots of Luther’s theology of the cross, and his subsequent scholarly work has focused on the religious culture of Lutheranism, particularly its worship and piety, with a special interest in the visual arts and architecture. Guy Erwin is the ELCA’s first synod bishop who is gay and partnered. 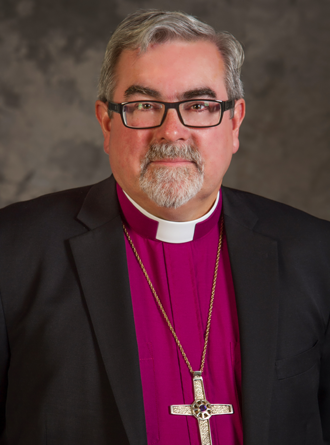 Bishop Erwin is also part Osage Indian—born in and still active with the Osage Nation of Oklahoma—and his Native heritage makes him another “first” among ELCA bishops. In the ELCA Conference of Bishops, Erwin serves on the Executive Committee and as Region 2 liaison bishop to the ELCA Church Council, and on the bishops’ ready benches for Justice and for Middle East Peace. During the Reformation anniversary year in 2017, Bishop Erwin was in high demand as a teacher and speaker, and gave 30 lectures and presentations in the United States and Germany that year in addition to his normal duties as bishop. Through the Lutheran World Federation and his work with the Faith & Order Commission of the World Council of Churches, Bishop Erwin maintains an extensive set of international connections, particularly in Germany and the Nordic countries. As well as serving as part-time interim pastor for three ELCA congregations in California (Living Faith, Santa Clarita; St. Andrew’s, West Los Angeles; and Faith, Canoga Park), Erwin also served (before his ordination in 2011) as part-time minister for worship and education at St. Matthew’s in North Hollywood, California. In Connecticut he served part time as lay parish associate at Emanuel, New Haven, for a dozen years while studying and teaching at Yale.